If at first you don’t succeed . . . you may not do much better the second time, either! That was my fate when following a recipe for coffee panettone sent to me by my friend Jennifer with a note saying “I have made this – delicious.” With the Christmas season already thundering down on us like a runaway herd of reindeer, I thought it would be interesting to give it a try. 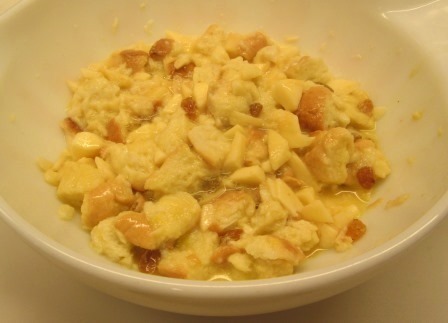 It was clear from the first that “panettone” was purely a courtesy title for this confection. True panettone is rich in butter and eggs; this recipe uses no eggs and only a dollop of vegetable shortening. It doesn’t even call for kneading the dough; just mixing it. 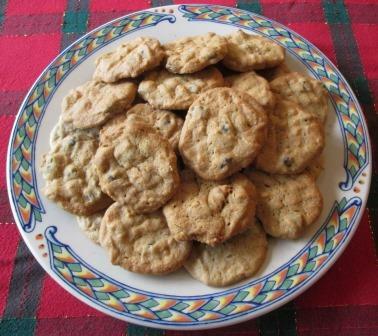 It also must be quite an old recipe, because it calls for “seedless” raisins. How long has it been since that had to be specified?! 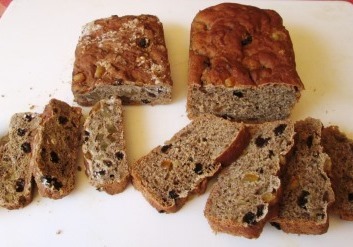 Nonetheless, I figured that, even if this was only a sweet tea bread, it could be good. 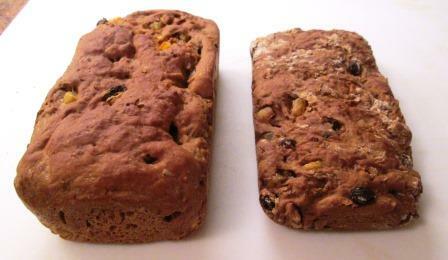 I was feeling experimental, and this is the season for fruit-and-nut breads. 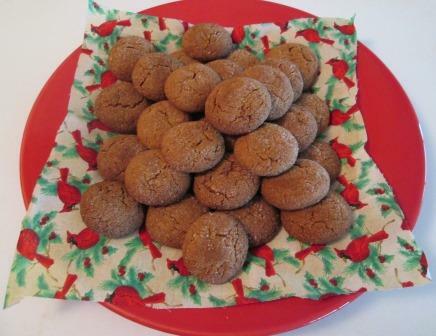 So I made a batch. 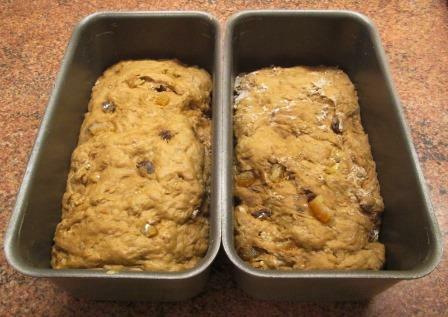 I began by chopping walnuts and candied orange peel – proper seasonal ingredients – to accompany the raisins. For the dough I first had to dissolve yeast in warm water and a cup of “strong warm coffee”; add soft shortening, salt, sugar, and baking soda; and stir in enough flour to make a batter. I confess to using melted butter for the shortening and very strong instant espresso for the coffee. After another two hours, when the loaves had grudgingly risen as much as they evidently intended to, I baked them at 350° for 40 minutes. The dratted things didn’t rise any more in the oven either – in fact, they sank somewhat. 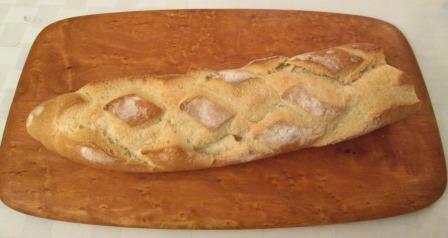 That made for heavy, dense, chewy bread. 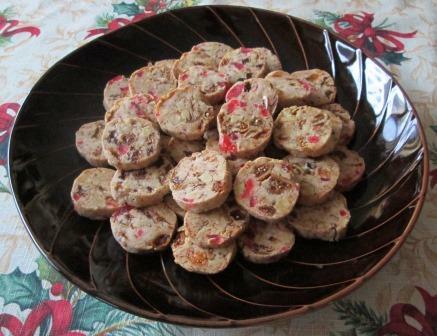 Though it was fairly ugly, it didn’t taste too bad: sort of like a panforte or a not-very-sweet fruitcake. Lightly toasted and slathered with butter, I thought it was edible. Beloved Spouse, my personal Grinch, did not. 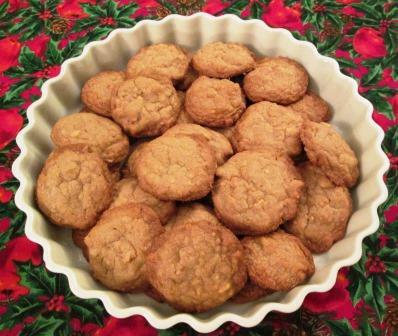 Now, as it happened, Jennifer – the donator of the recipe – came for a visit a few days later. I hauled out one of my bricks of panettone and showed it to her. “Did yours come out like this?” “No, it didn’t.” I gave her a taste. She said kind things. I gnashed my teeth. Obviously, I’d done something wrong. I thought it most likely that the coffee had been too hot, and maybe too strong, so it killed or crippled the yeast. I’d give it another try. I went through the whole procedure again, making a half recipe. This time my espresso was freshly brewed, not unusually strong, and only just warm. I used Crisco, not butter, and did no actual kneading, only vigorous mixing. The dough looked and felt better than the first batch, and it rose much more in the bowl, even though it still took nearly three hours to get there. It rose better in the pan too, so I was hopeful. But wouldn’t you know it, the same thing happened in the oven – it sank again! This time I have no idea why. This loaf looked more respectable than the first ones, at least: It was a whole two inches high, instead of only one inch. Also, it was lighter in weight, softer in texture, and altogether more pleasant tasting. I, at least, thought so. Beloved Spouse was not persuaded. More attractive, yes, but it still isn’t what it should be, and it definitely isn’t panettone. Will I try a third time? I doubt it. If I want a panettone for Christmas, I’ll buy a good one. Science has shown that you can make a silk purse from a sow’s ear. Sometimes kitchen arts can do that too. It worked, this week, for me. Beloved Spouse had innocently brought home a new variety of bread to try – a large baguette-style loaf listed by our usually reliable market as Italian Bread. It looked reasonable, though it felt a bit hefty. 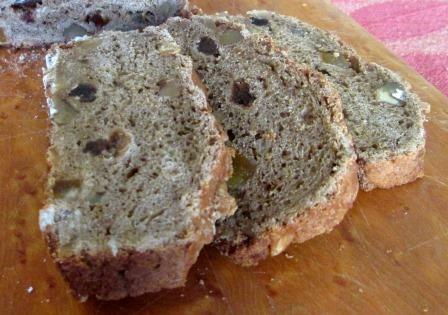 When sliced into, it proved to be essentially commercial white bread: The dense, fine, slightly sweet crumb had to have been due to more ingredients than the flour, yeast, and salt that a proper Italian loaf uses. When we want white bread in our house I make the White Bread Plus recipe from Joy of Cooking, and it’s a very different animal. So this travesty was going to be useless unless I found something decent to do with it. 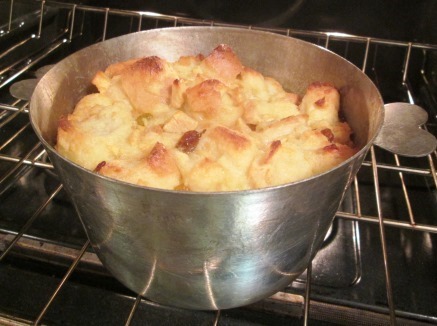 Resourcefully (she modestly said), I did: Bread pudding. From a few unfortunate restaurant experiences, I know it’s possible to produce a boring bread pudding, but all the ones I’ve ever made are wonderful simple desserts – easy enough for everyday use, interesting enough to serve to guests. So I set to work on this one, using only ingredients that I had on hand. My bespoke knife man (a big bread pudding fan) cheerfully reduced the loaf of bread to cubes. It made almost six cups’ worth. The next thing I needed was two cups of milk. I didn’t have any fresh, so I made up some with nonfat dry milk powder, boosting its butterfat with a leftover half cup of heavy cream. 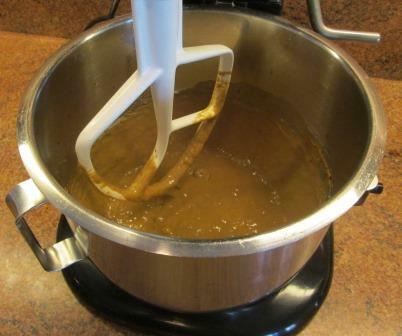 I scalded that liquid, melted in half a stick of butter, stirred in ⅓ cup of sugar, poured it over the bread, and left it for 15 minutes to be absorbed. Then I considered fruit for the filling. My fruit bowl contained several bananas, a pear, and an apple. Any of them would have been good. 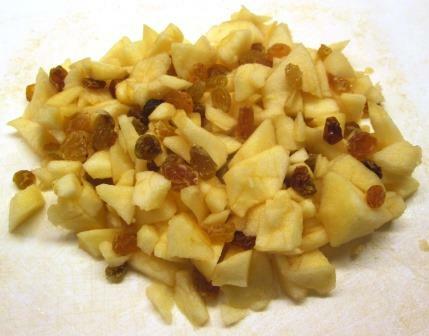 I chose the apple, peeled and chopped it, and added ¼ cup of raisins to it. 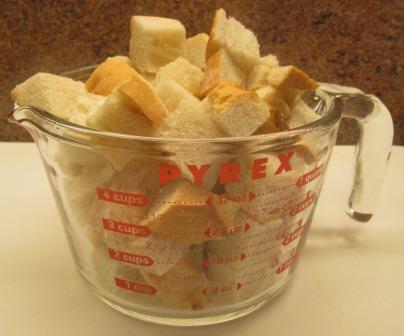 When the bread was thoroughly moistened, I mixed in the fruit, along with two eggs beaten with a teaspoon of vanilla extract and a pinch of salt. The pudding mixture went into a heavily buttered baking dish and then into a 350° oven for about 45 minutes, until the top was lightly browned and a knife inserted into the center came out clean. It was a delight, as always – warm and fragrant, lightly fruit-sweet, moist enough not to need a sauce (though it never objects to a ladleful of crème anglaise). Of course, there was far more than two of us could eat at a sitting, but one of the beauties of bread pudding is its resilience. It keeps well, reheats well – even freezes well, though mine rarely lasts long enough for that. 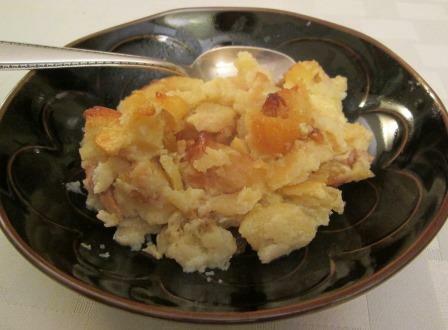 Best of all, in any of its homely or elegant variations, bread pudding is a thoroughly comforting thing to eat. And given the way things have gone this fall, we all need as much comfort as we can get. Beloved Spouse and I may eat a lot of bread pudding this winter.